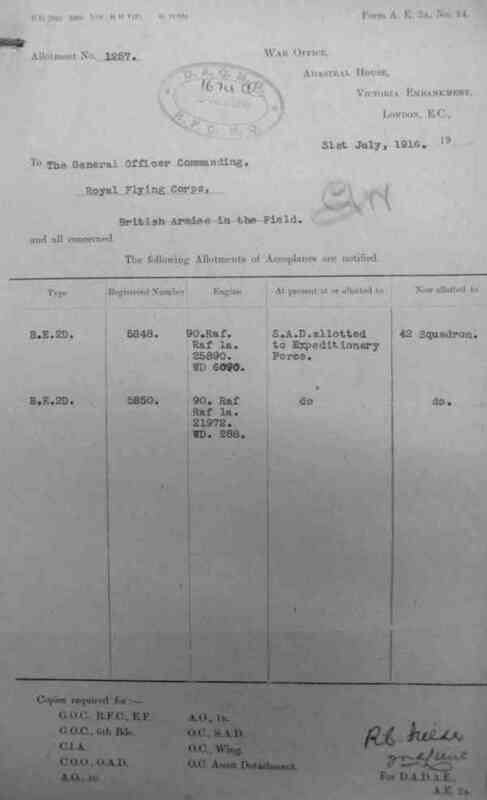 The following sections describe the principal documentation available in the National Archives and elsewhere in respect of Royal Flying Corps and Royal Air Force aircraft prior to 1919. I have transcribed many of these documents, and the links below allow you to download these files. Unfortunately the movements cards documenting the history of RFC/RAF aircraft before 1930 have been lost. Consequently the only way of determining the history of these aircraft is to reconstruct the movements from the surviving documentation. The quality of record-keeping varied considerably and the records contain many errors. Often pencil was used to record entries and the quality of handwriting was often poor, making interpretation difficult. It was common for the letter prefix of serial numbers to be omitted. The majority of surviving documents relate to the Expeditionary Force in France. Few records exist in respect of aircraft allotted to Training, Home Defence or other overseas theatres of war. All files are in comma separated value (.csv) format which can be edited with a text editor or loaded into a spreadsheet. The majority of files are in a standard format to aid analysis. View a list of abbreviations. I have combined all the files and sorted the data by serial and date in order to show the known history of each aircraft - see 'Combined movements files' below. In addition I have produced a schedule of all early RFC/RAF serials (excluding RNAS aircraft). This includes cancelled batches and aircraft for which no history is known -see below. These files exclude entries in the main files for which no RFC/RAF serial can be identified and aircraft with overseas serials. The original documents contain many errors. I have corrected many of these, indicating the nature of the correction in square brackets ('[...]'). However, many errors still remain to be resolved -see queries list. Consequently whilst I have endeavoured to make the data as accurate as possible it is supplied without any warranty or acceptance of liability for errors or omissions. References commencing 'AIR', 'AVIA' or 'MUN' refer to documents held in the National Archives. References commencing 'AWM' refer to War Diaries and other documents held by the Australian War Memorial. To download a file right-click on the link and select 'Save file as...' or 'Save link as...'. These files combine all of the individual data files, sorted by serial number and date. They only include entries for which a RFC/RAF serial is specified. 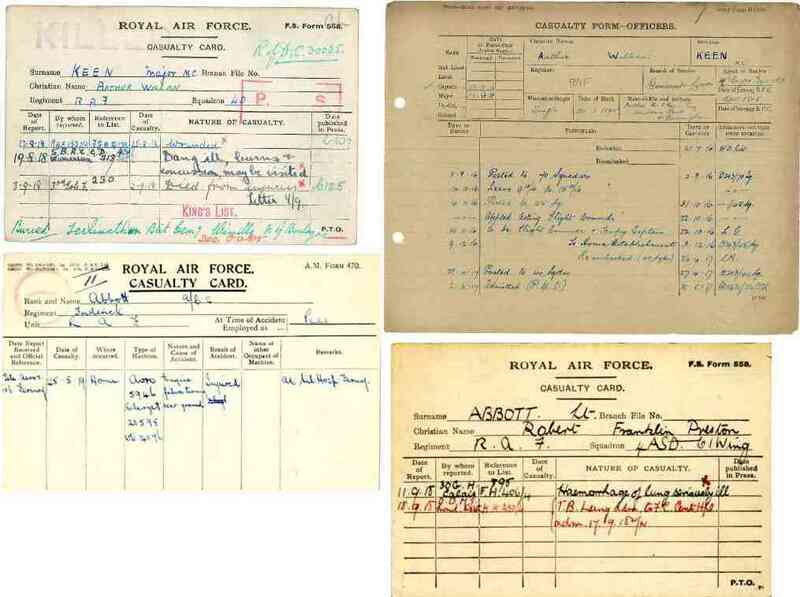 The individual files detailed below also contain many entries against which no RFC/RAF serial is noted and also some RNAS and overseas serials. These files list all the serial numbers issued by the RFC/RAF up to the 11th November 1918 and include the known history of each aircraft, together with comments, contract details and other information. NOTE: These files are not in the standard format, and the histories are presently incomplete - refer to the 'combined movements files' above for full histories. Prior to the establishment of the RFC in April 1912 about 25 aircraft were acquired by the Army and 9 by the Navy. These were serialled B1-7, F1-8, BE1-6, FE2, RE1, RE2, SE1, H1, H5, M1-2 and T1-5. 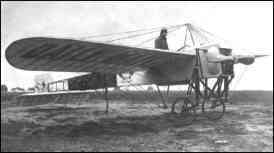 In 1912 the surviving aircraft were re-serialled in the RFC series above. From April 1912 to mid-1914 (serials 201-501 and 601-747) small contracts were awarded to firms for the construction of private designs and the designs of the Royal Aircraft Factory. Serial numbers were allocated upon allotment of each machine to a unit after delivery to Farnborough and not upon issue of the contract. Early serials were grouped into sequences relating to the squadron or unit the aircraft was issued to (see serial system) and thus serials were not issued in numerical sequence. From serial 502 onwards (excluding 601-747) serials were issued sequentially in blocks at the time the contract was awarded. The contract ledger in AIR 20/761 (commencing with serial 502, but excluding 600-747) shows each batch of serials, the manufacturer, the contract number and date. Some contracts were cancelled and the serials re-issued, and some blocks were issued for purchases of French aircraft by the Expeditionary Force and aircraft reconstructed by one of the Aircraft Depots. All early aircraft were delivered to Farnborough where they were erected, inspected, modified as required and test flown. A receipt was given to the supplier. The aircraft was then handed to the Military Wing or Central Flying School and formally 'taken on charge'. In the case of early deliveries this process could take up to 6 months. Increased production following the declaration of war made this system impractical and Aircraft Inspection Department ('AID') inspectors were employed in factories. In 1917 a system of Aircraft Acceptance Parks was established near to each factory group for the receipt and inspection of aircraft. The ledger does not show serial numbers, but I have added these based upon the contract ledger referred to above. An attempt was made in September 1916 to summarize all the early contracts from mid-1914 to December 1916. The analysis appears in file AIR 2/124 but contains several errors. Prior to the war a number of aviation-minded individuals donated aircraft to the fledgling air service in order to stimulate the growth of aviation. The Duke of Westminster presented a Bleriot to the War Office in 1910 and a Voisin in 1911. The Maharaja of Rewa made a gift of £1142 in respect of a BE2a for the Indian Central Flying School in 1913 (serial ICFS1). During the war individuals and groups around the Commonwealth were invited to contribute a nominal sum towards the war effort in return for which an aircraft would be inscribed with a name of their choice. In the event of the aircraft being destroyed the name was transferred to another machine. Details of presentation aircraft appear in the Cross and Cockade journals Volume 14 No.2 and Volume 20 No.2, and the book 'Gifts of War'. Original records appear in the TNA files AIR 1/14, AIR 1/142, AIR 1/651 and AIR 1/903. A photograph was taken of each aircraft and consequently a significant photographic record has survived. Many of the names were incorrectly painted on aircraft, an example being 'Warneford Burma' which appeared on at least one aircraft as 'Waringford Burma'. Aircraft subscribed by individuals were to have the inscription on the side of the fuselage, and those subscribed by Army units and towns inscribed on the cowling. This rule was not always followed. Prior to the war, lists of machines in private hands were prepared on a regular basis. Upon mobilisation the War Office impressed a number of these machines into service with the RFC and RNAS. Many aircraft had been purchased from French manufacturers prior to the war and the majority of engines were of French design. Upon arrival in France the Expeditionary Force set about acquiring further supplies. Unfortunately poor records were kept of the early acquisitions. 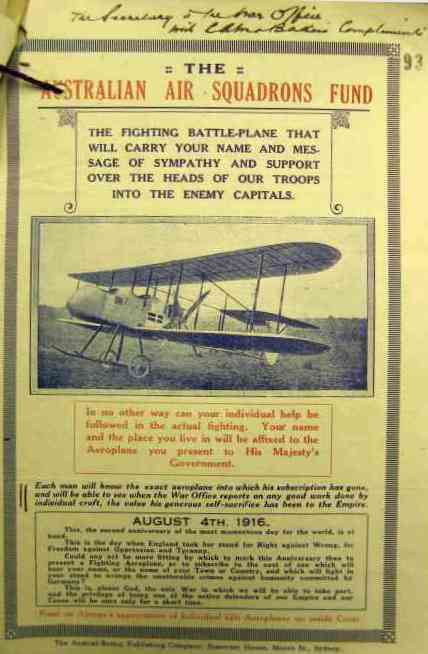 During 1915 a British Aircraft Purchasing Commission was established in Paris and produced weekly reports. These only quote French serial numbers as the RFC serial was only allotted when the aircraft was delivered to the Aircraft Park or England. From January 1916 fortnightly reports were submitted listing aircraft received from French sources. The report for the first 2 weeks of June 1917 is missing, but I have reconstructed the report for this period. 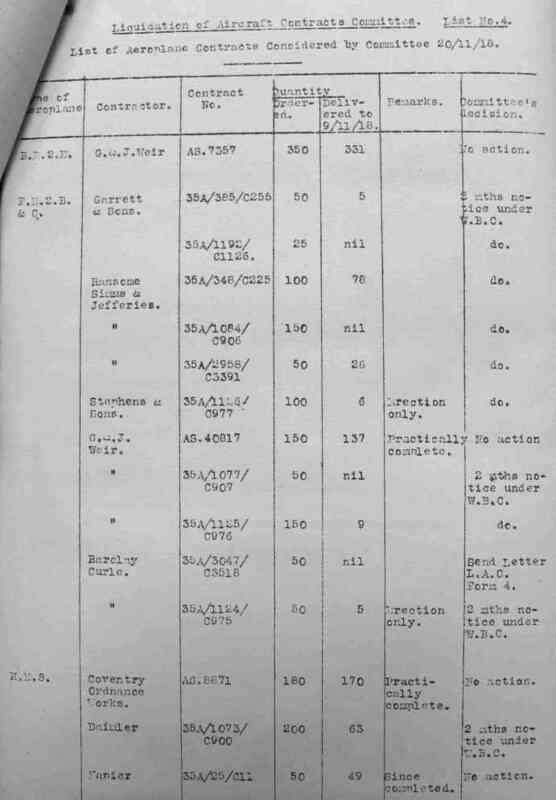 Download a reconstruction of the fortnightly list for 1-15 June 1917. 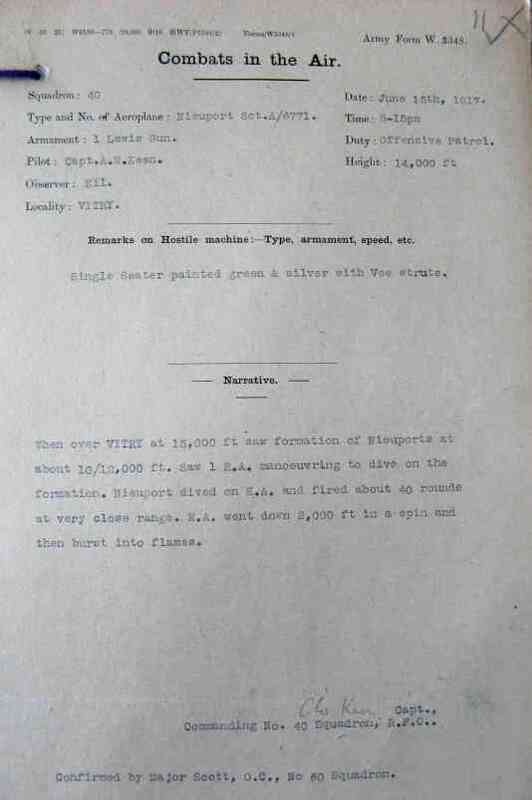 Details of Aircraft movements from the British Aircraft Purchasing Commission reports have been included in the 'miscellaneous' file below, under the class 'Paris'. Once an aircraft had passed inspection by the Aircraft Inspection Department ('AID') it was handed over and allotted to a particular branch: the Expeditionary Force, Central Flying School, Home Defence, Training or other unit. The specific squadron would not normally be identified on the allotment instruction. Allotments were initially given a sequential number, prefixed 'A' for aircraft ('T' being used for transport). 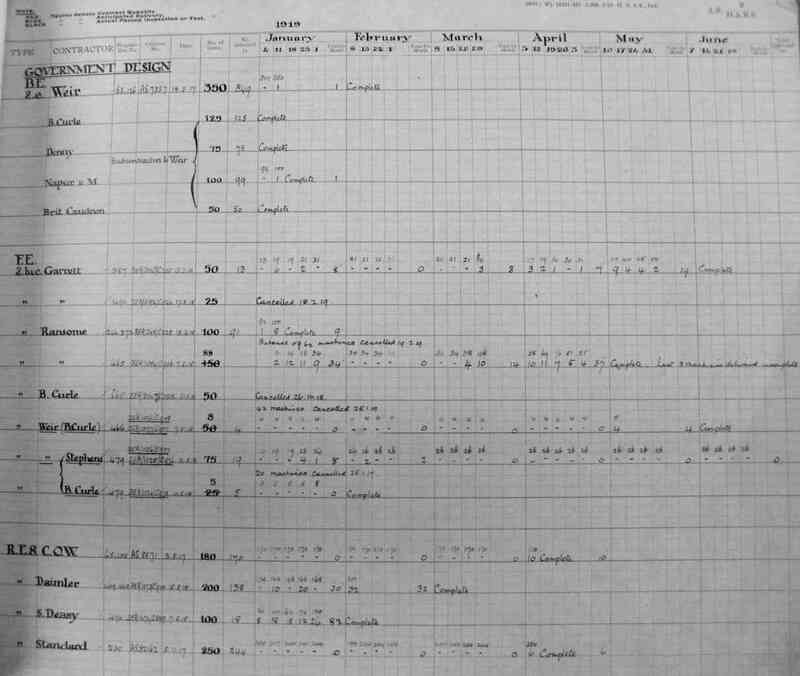 The individual allotment sheets appear in a large number of bulky files covering the period from September 1914 to April 1919. Some early allotments can be identified from correspondence registers. Unfortunately most of the forms authorising allotments to the CFS, Training and Home Defence have not survived. 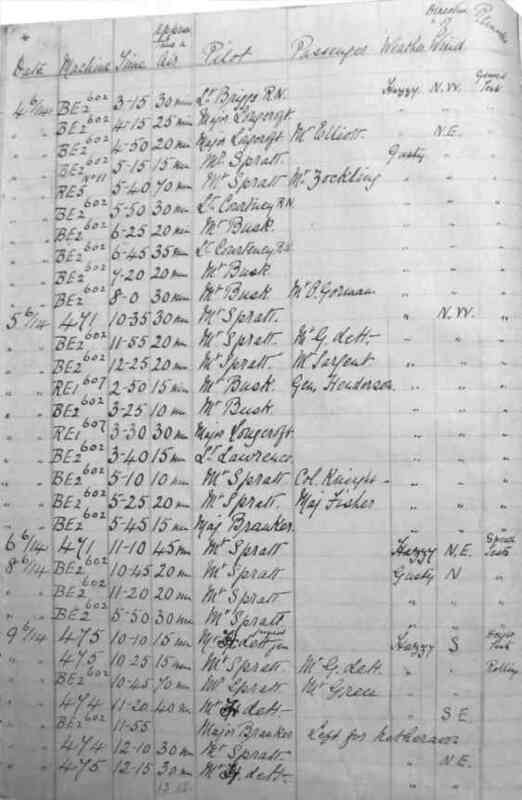 Each aircraft had a log book in which all flights were recorded along with the name of the crew. Following a number of early accidents involving aircraft that had been badly repaired, it was also a requirement to document all maintenance work in the book. Sadly, only about 160 logbooks survive. I have transcribed the key data and incidents from each of these logbooks into the file below. Schedules of aircraft despatched to the Expeditionary Force were prepared monthly. 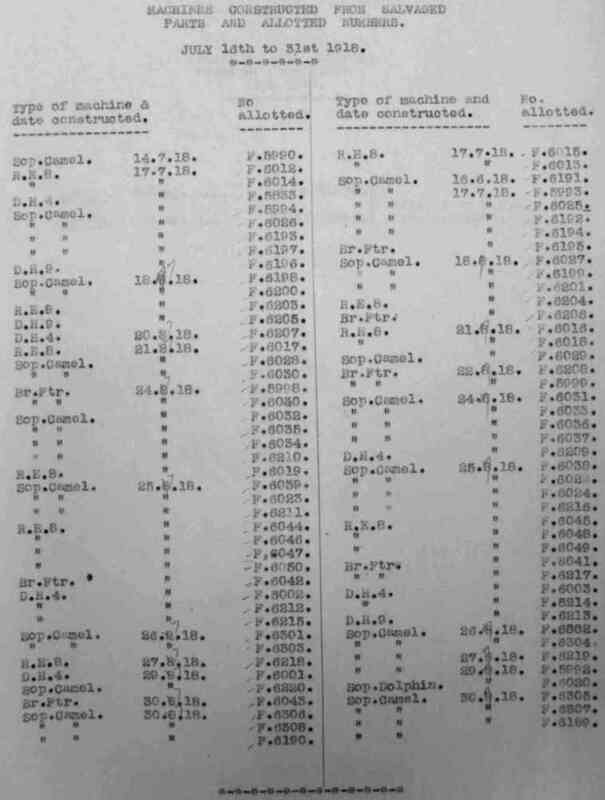 These comprised a summary sheet showing despatches of aircraft of each type against the number requested, and individual sheets by aircraft type listing the serials of aircraft sent. Lists for the period January 1916 to May 1918 survive. 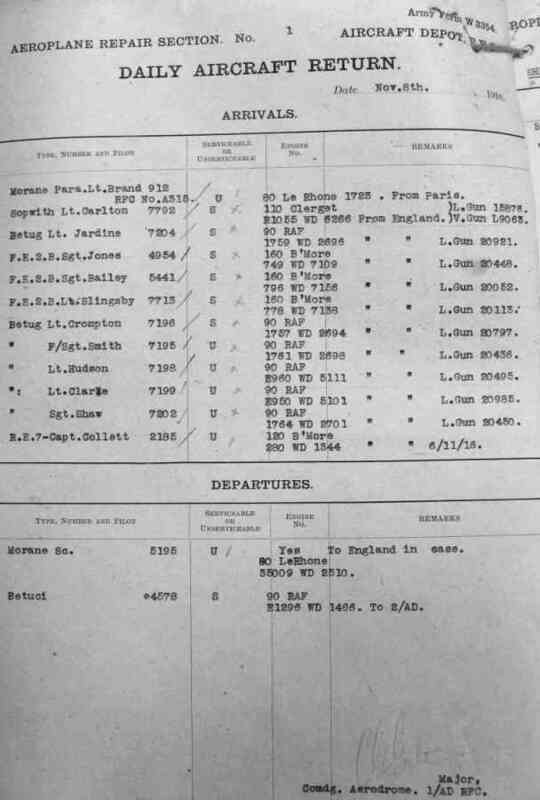 In France, aircraft were delivered to one of the Aircraft Parks, the principal ones being 1AP at St Omer (known as 1 Aircraft Depot from 13.12.15) or 2AD at Candas (originally 2AP in England) from where they were distributed to squadrons. The Parks kept separate record cards for both aircraft and engines. Initially pink cards were used to document receipts and despatches. The information on the cards was transcribed onto daily reports showing the serials of aircraft on charge, arrivals and departures. Aircraft Parks in other theatres of War included 'X' AP in Egypt, 'X' AD in Palestine, and 'Z' AP in Italy. No known records survive for these units other than routine orders (see below). Similar reports were prepared in respect of aircraft engines. These duplicate much of the information on the aircraft return, but are useful in filling gaps or resolving errors. As the war progressed the Aircraft Parks were divided into sections: Reception, Issues, Repair and Salvage, each of which produced separate reports. The above files only list receipts and despatches of aircraft, but I have prepared a list of all aircraft on charge of the aircraft parks at a number of dates at the beginning and end of each missing period. Squadron Quartermasters (often referred to as 'Q' branch') or Equipment Officers maintained a record book recording all the equipment held by the squadron: aircraft, engines, guns and motor transport. A few of these books have survived. A report showing the daily state of aircraft and personnel was submitted. This was intended to show total numbers rather than individual serials, but a few reports also show aircraft serial numbers. Weekly returns were submitted showing the aircraft on hand and movements during the week. From March 1916 Army Form W3351 was used. Surviving reports cover Dec 14, and Aug 15 to Sep 1918 with some missing periods. The files containing these returns also include weekly lists of aircraft struck off charge. From August 1918 the weekly returns were lodged fortnightly, although the same form was used. 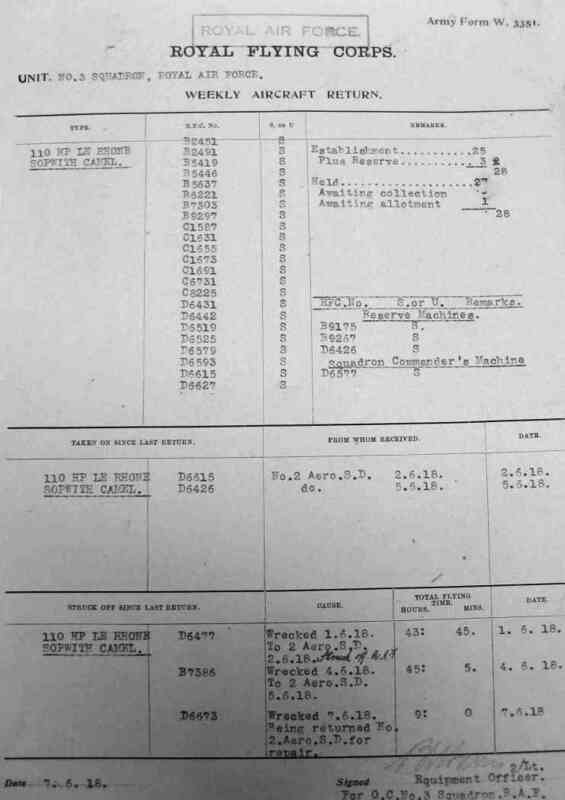 The Australian Flying Corps maintained schedules of aircraft received from the Aircraft Parks, returns and writeoffs. For the missing returns I have compiled schedules of all the aircraft held by each squadron at the beginning and end of each missing period, and also the last known report in September 1918. 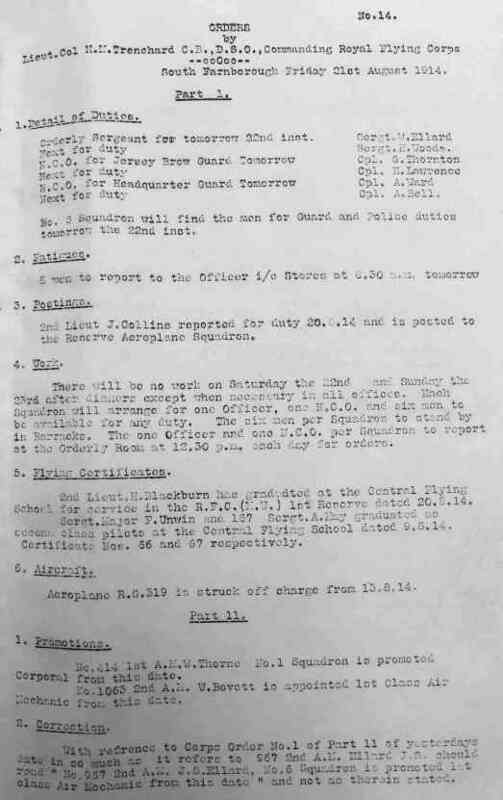 Each unit of the RFC/RAF prepared Daily Routine Orders showing the activities for the day, changes in personnel and equipment, and other notices. These give an interesting insight into daily activities but also reinforce the information contained in the daily and weekly reports. For some units, particularly those in the UK and in non-Western Front theatres of War the RO's are the only surviving source of information. Because each unit in the hierarchy prepared RO's there is significant duplication of reporting: there would be a RO at the HQ, Wing and squadron level. This can be useful in helping to resolve errors and filling gaps. Combat reports were prepared in order to detail any contact with the enemy. A compilation of combat reports and combat-related casualties, along with a useful narrative of the context in which they occurred, appears in the book 'The Sky their Battlefield' by Trevor Henshaw. Combat Reports are not presently included on this site. Once an aircraft was totally wrecked, lost or disposed of, it would be struck off charge, meaning it was no longer considered an asset of the RFC. Squadrons had the power to formally SOC aircraft and this would be the normal policy if an aircraft went missing. Where wreckage was recovered however the wreck would generally be sent to the Aircraft Park and a decision on whether to write it off was made there. This can result in some confusion with aircraft being recorded as struck off charge twice: by the squadron and the AP. 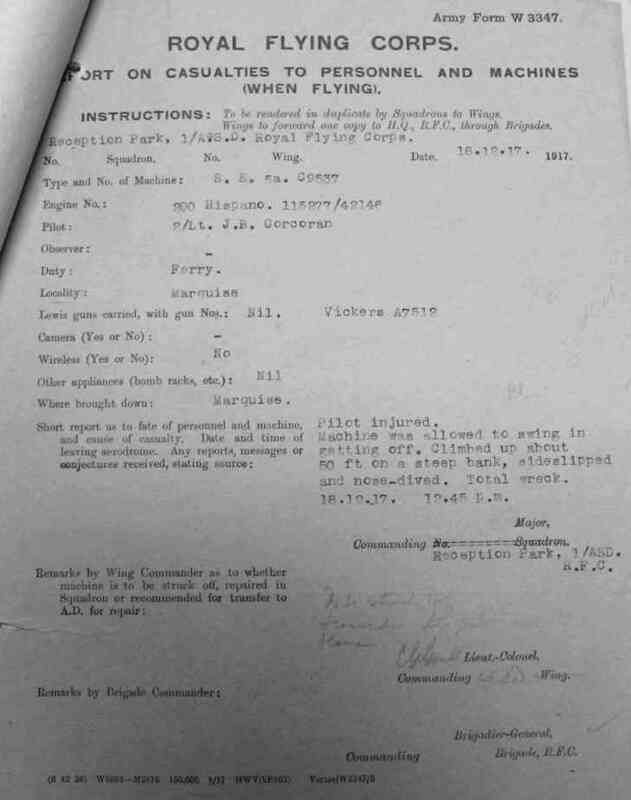 Form W3347 was used to authorize the strike off or transfer of a machine to the Aircraft Park (see Casualty reports below). Army Form W3347 was used to authorize the striking off of an aircraft by the squadron, or the transfer of the machine to the Aircraft Park, in those cases where repairs in the squadron would take longer than 36 hours. They were not used to record minor damage to a machine, nor incidents in which there were personnel injuries or death but no damage to the machine (see Casualty Book and Casualty Cards below). The form had to be completed and authorised before a replacement machine could be issued, and consequently the details were normally reported by phone and the report sent to HQ by despatch rider shortly after. As a result further details (for example in the case of missing machines) could come to light after completion of the form. The form was supposed to include details of casualties to personnel, although this was not always done. An index to the names appearing in Casualty Reports and other documents can be accessed via the 'People' section of this site. 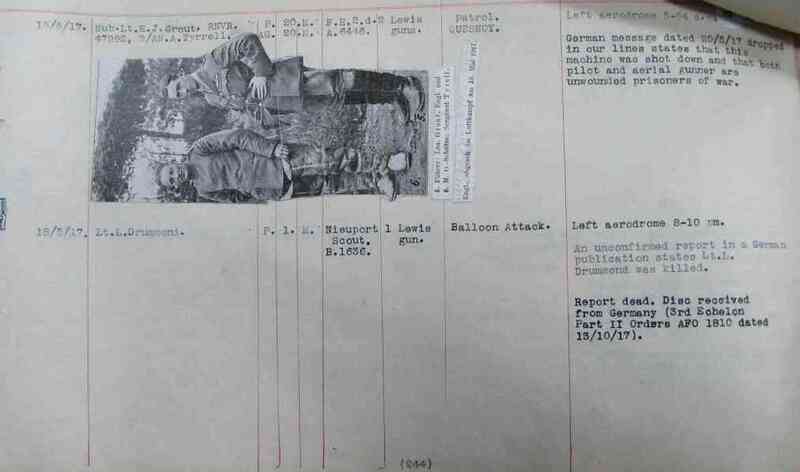 Loose leaf sheets were typed each day by RFC HQ in France listing serious casualties to personnel while flying. Minor injuries not requiring hospital treatment were normally excluded. The sheets were subsequently updated if further details came to hand, for example the fate of missing crew. As a result the Casualty Book is more up to date than the Form W3347 Casualty Reports. An index to the names appearing in the Casualty Book and other documents can be accessed via the 'People' section of this site. 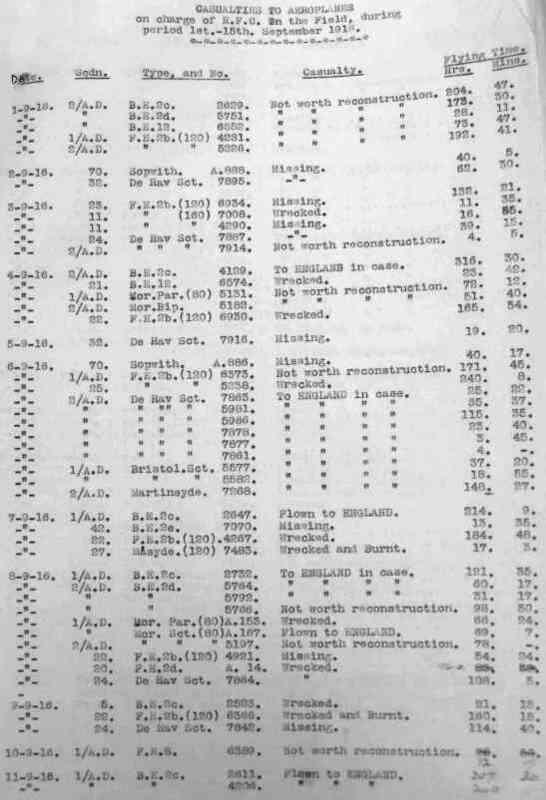 Individual personnel casualty cards, showing injuries to officers and men, were maintained on a number of different forms, including Army Forms 470 and 558. Unlike the Casualty reports and book mentioned above, the surviving reports include injuries sustained during training, home defence, and theatres other than the Western Front. The forms are maintained by RAF Museum at Hendon and have recently beeen digitized and made available on the RAF Museum website. Individual personnel Service and Casualty Forms on Army Form B.103 show each officers postings including transfers to hospital, to Army units, relinquishment of commission etc. The forms are maintained by RAF Museum at Hendon and have recently been digitized and made available on the Casualty Formswebsite. The repair and reconstruction of aircraft at the Aircraft Depots represented a significant source of equipment supply. Aircraft reconstructed from parts would be given a new serial, and in some cases the original airframe number would be identified. Separate sequences of serial blocks were issued to the various Depots for application to reconstructed machines. Few records survive of the individual types allotted to each serial and in many cases these can only be identified from subsequent records relating to the movement of these aircraft. 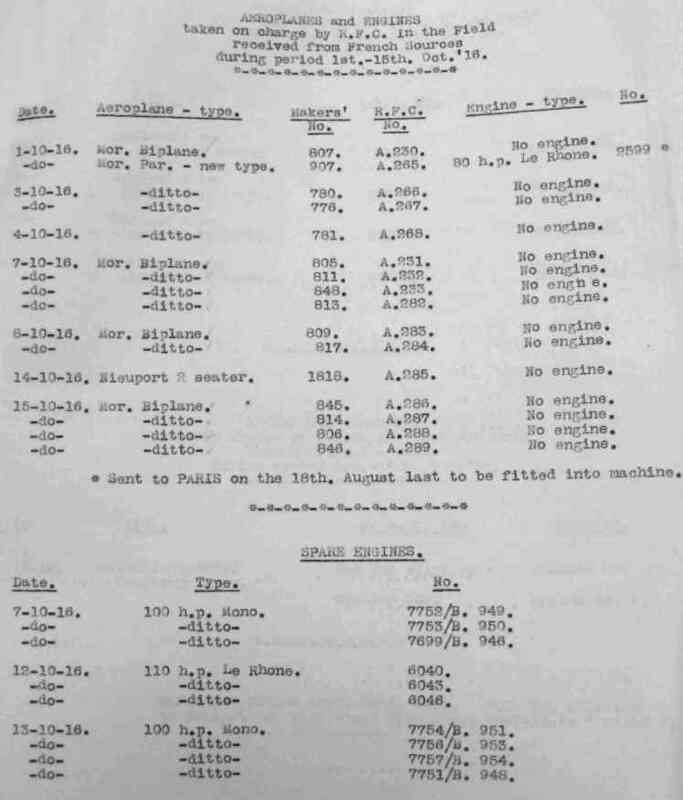 However, some schedules were produced and appear together with the fortnightly lists of aircraft SOC (see above). The serial batch F5801-F6300 was one of the batches issued to the Aircraft Depots in France for application to rebuilt machines. Unfortunately the Depots got a bit carried away and continued to issue serials up to at least F6513, thus duplicating numbers with an order for Sopwith Camels in the F6301-F6500 series. All the duplicated serials were renumbered in the H series. Download a list a duplicated reconstruction serials. Each pilot maintained a log book recording all flights. Unfortunately it was common to omit the letter prefix from the aircraft serial, and the location of the flight, and squadron or unit the pilot belonged to, was generally not shown. 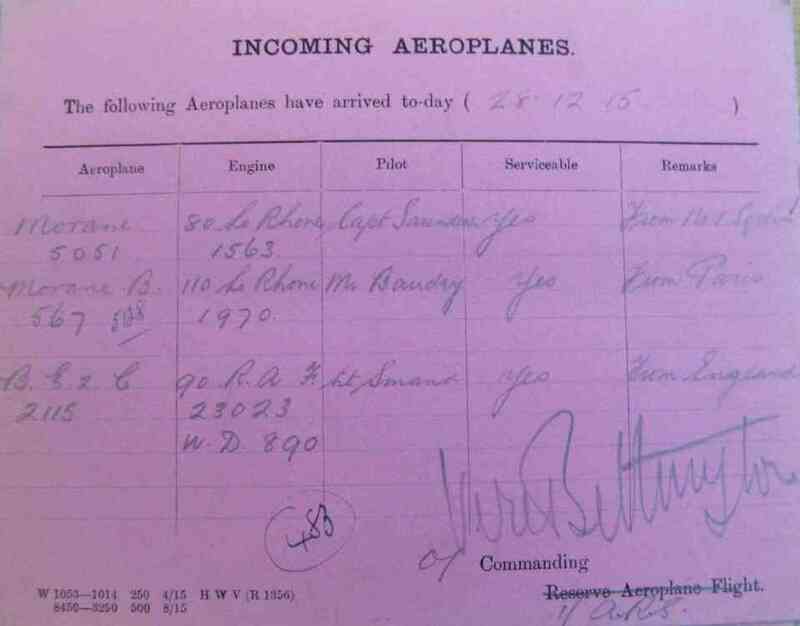 Despite this the log books are a useful means of identifying aircraft in training units and Home Defence. Sadly the Royal Air Force destroyed a vast number of log books in the 1960's. 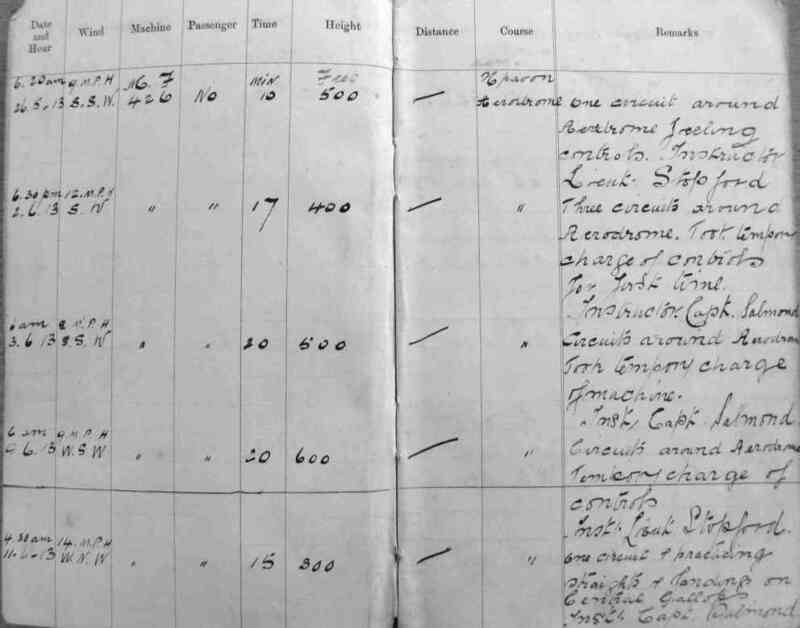 I have transcribed a few pilot log books and I am keen to obtain copies of as many more as possible - please contact me if you can contribute to this site. Farnborough was the base of the Administrative Wing of the RFC/RAF and home of the Royal Aircraft Factory. 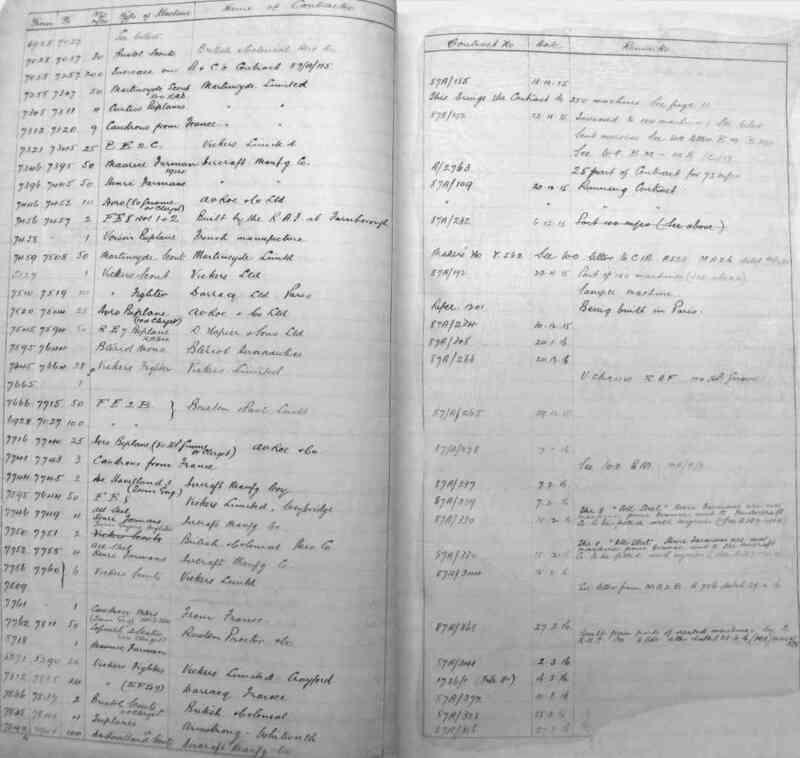 A log was maintained of all the flights from the aerodrome, the surviving books commencing on the 14th May 1914. The majority of entries relate to test aircraft, prototypes and aircraft built by the Royal Aircraft Factory. If an aircraft made more than one flight in a day I have recorded the serial only once. At present I have only transcribed the log to 31 December 1919. The RAF undertook strenuous enquiries to establish the fate of aircrew missing in action. Missing lists were produced and significant correspondence generated. Reconnaissance/Bomb dropping reports record individual missions, although not all reports show the serial number of the aircraft and many contain errors. Few reports survive and the quality is generally poor. A Court of Enquiry was held for all serious pre-war accidents and a few reports have survived. Correspondence provides a further source of information in respect of personnel and aircraft movements. In addition the correspondence registers provide details of early allotments and write offs. Each unit maintained a War Diary although the quality varies considerably between units. This was a narrative record of daily operational events. The schedule of all flights by a squadron, listing serial numbers and pilots, was known as the Record Book. Post-war these documents were combined into an Operations Record Book ('ORB'). 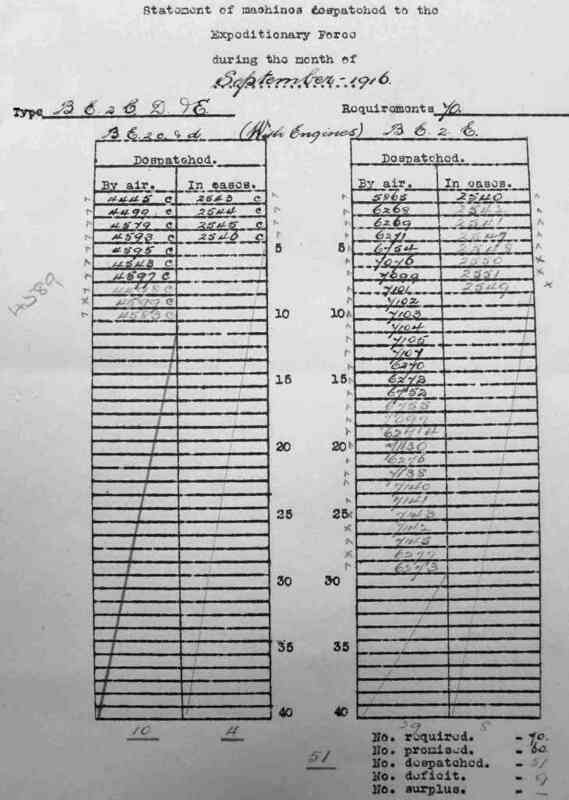 A Census of surviving aircraft was carried out on a number of occasions and the resulting correspondence provides information in respect of recording errors. The individual aircraft movement/history cards were lost in a flood after the war. Surviving cards commence in about 1930 and are held on microfiche at the RAF Museum. I have combined the contents of various other documents into a miscellaneous file. Download a schedule of aircraft movements from miscellaneous records. At the end of the war there were over 100 outstanding contracts for aircraft and in excess of 22,000 aircraft on charge of the RAF. Deciding what to do with this surplus proved a major logistic and political issue. Most contracts provided for advance notice of termination and thus production continued for some months after the end of the war. After estimating the post-war needs of the RAF it was estimated that there would be over 10,000 surplus aircraft and 20,000 engines. Upon the termination of hostilities a Liquidation Commission was established with the task of terminating and settling outstanding war supply contracts. Contracts that were substantially complete were generally allowed to run their course. Other contracts were generally given 2 months notice to terminate. The minutes of the Commission record the negotiations that took place. Several manufacturers, including A.V.Roe, bought back substantial numbers of aircraft for sale on the civil market. The Disposals Board had the responsibility to dispose of surplus stocks, including aeroplanes, and by mid-1919 had sold 266 aircraft and 907 engines. In March 1920 an agreement was entered into between the Ministry of Munitions and the Aircraft Disposal Company ('ADC'), a company effectively controlled by Handley Page, for the sale of the whole of the surplus stock of aircraft and engines at a purchase price of one million pounds plus a share of profits of the company. Unfortunately no records can be traced of the aircraft actually supplied to, or disposed of by, ADC. Aircraft in overseas theatres other than France were generally disposed of in situ, as it was not worth returning them to the UK. Aircraft on charge of squadrons that were disbanded post-war were either broken up, flown to an Aircraft Park, or flown to 'demobilization squadrons', who would ferry the aircraft back to the UK. Aircraft were supplied to various Governments on a repayment basis, including France, Greece, Japan, Latvia, Russia, Roumania, Norway Belgium, Estonia and the USA. A free issue of 40 DH9 aircraft was made to Greece and also free issues to Poland and Chile. In order to foster the development of aviation in the Commonwealth, and recognize the contribution made to the war effort by Commonwealth countries, an 'Imperial Gift' was made to each of Australia, Canada, South Africa, India and New Zealand. This comprised 100 aircraft each, plus the number of aircraft donated by each country during the war. For a detailed list of these aircraft, see Imperial Gifts (related external link). Once civil flying restarted in March 1919 a Certificate of Airworthiness was required for any aircraft flying in the United Kingdom, although certain foreign-certified aircraft were exempt. All war surplus aircraft flying in the UK, including aircraft delivered overseas by air, required a CoA. Consequently civil CoA registers for the UK and overseas include details of former RAF aircraft converted to civil use. Download a schedule of British and overseas post-war civil registrations of ex-military aircraft. On 1st January 1920 the RAF had 15,802 aircraft on charge, of which 5,582 were considered obsolete. Of the total, 326 were allotted to Colonial governments, 1017 were at overseas stations and the balance at home. A few movement cards, accident cards and other records provide a fraction of the histories of these aircraft. 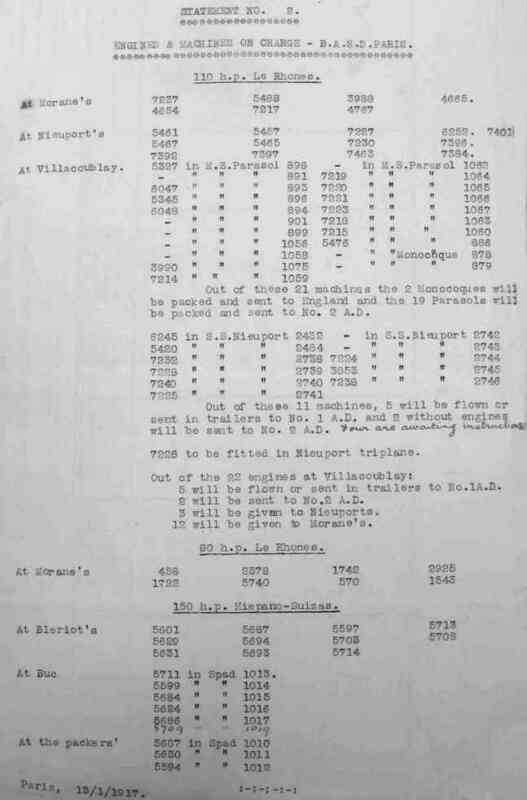 Download a partial schedule of aircraft surviving in military service after 1st January 1920.